Well, good news folks. WordPress 2.5 will be available soon. The WordPress team had been working with the people from Happy Hog and a new design of WordPress has been built. 1. A customizable dashboard, multi-file upload, built-in galleries, one-click plugin upgrades, tag management, built-in Gravatars, full text feeds, and faster load times. – I’ve been waiting REALLY REALLY long for multi file upload to happen. I’m sure many wordpress bloggers feels the same too. – One click plugin upgrades. Finally. At last. No more wasting time clicking+downloading+uploadoing+upgrading existing plugins! 2. A new navigation menu cutting down the amount of menus by 50%! 3. The new visual editor even has a handy full-screen mode to help block out distractions while composing your newest post. – Sounds like a nice feature to keep you focused while writing good contents. – From the pic itself, I can’t notice much had changed apart from the colors. 4. The Manage screens have been redesigned and unified so that now, managing your pages, posts, media, and comments all use similar, consistent interfaces. – Sounds boring. I thought that was what previous versions of WordPress can already do? Besides, I don’t have much complaints of the existing mechanisms on managing pages, posts, media and comments either. Just have to wait now to see how this has change in WordPress 2.5. 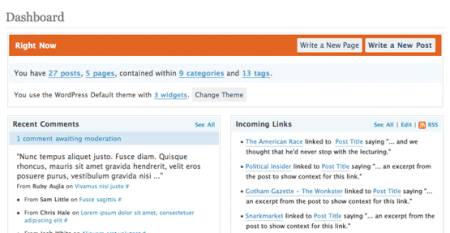 For more new features and sneak peeks from wordpress 2.5, pay wordpress a visit.